The San Fernando Valley Bar Association recently held an Open House to celebrate the official opening of its new offices. 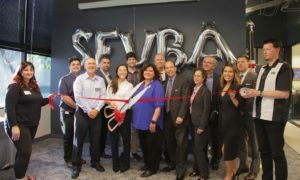 A large crowd of members, Trustees and state, county and city officials were on-hand to celebrate the event and witness SFVBA President Yi Sun Kim ‘cut the ribbon’ to open the new suite. Kim also received several official commendations commemorating the event on behalf of the 2,000-plus member organization. The new, spacious SFVBA office suite, located at 20750 Ventura Blvd. in Woodland Hills, serves as the Bar’s headquarters and focal point of its administrative, communications and educational activities, as well as the operations of its Attorney Referral Service.